Nikkei Home Builder offers practical information on home design and construction to help its readers keep up with the changes of the times and the market. The magazine covers the most up-to-date information on technology, sales, management, design and construction materials as well as solutions that its readers may face day-to-day. 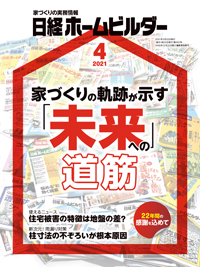 Embracing professionals at design offices, suppliers of construction materials/facilities and trading companies in its readership, Nikkei Home Builder takes pride on being the one and only magazine for the Japanese home building industry. Key advertising clients include manufacturers and suppliers of building materials, housing facilities and vendors of architectural/presentation software.